AKIPRESS.COM - Since the start of the century, the economies of Central Asia’s six states, with a combined population of nearly 75 million, have collectively grown by an astonishing 19.7% per annum, according to the World Pipelines article. Kazakhstan, the region’s largest economy, has seen its GDP grow 11 times from $18.3 billion in 2000 to more than $200 billion in 2012. After quadrupling the past 12 years to $51 billion, Uzbekistan’s economy will grow at an even faster rate to overtake Kazakhstan to become Central Asia’s largest by 2035, predicts the Asian Development Bank (ADB). 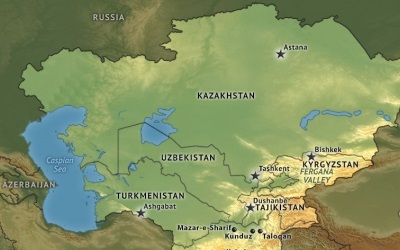 The economy of Turkmenistan has reported growth rates of 22.7% between 2000 and 2012. The economies of Kyrgyzstan and Tajikistan have grown by an annual average rate of 16.1%, from $2.23 billion in 2000 to $13.46 billion in 2012. Thus, the ADB is predicting that gas-powered Uzbekistan will overtake Kazakhstan to become Central Asia’s largest economy by 2035. By exploiting new gas reserves in the southwestern Gazli region and developing ties with China, Uzbekistan will grow its economy by an annual rate of 6.4% from less than $28 billion in 2010 to more than $128 billion in 2035. Citing the U.S. Energy Information Administration, the ADB said Uzbekistan will raise its natural gas production from 60 billion m3 in 2010 to 71 billion m3 in 2015, and 80 billion m3 in 2035. With oil reserves estimated at less than 600 million bbls, Central Asia’s most populous country will likely cease being an oil exporter after 2035. The ADB expects Kazakhstan’s oil production to increase from 1.6 million bpd in 2010 to 3.4 million bpd in 2035, due largely to rising supplies from three major fields, Karachaganak, Kashgan and Tengiz. The country is expected to sustain a 90% export level of its oil production through 2035. Kazakhstan will also be a major natural gas supplier with production forecast to rise from 17.6 billion m3 in 2010 to 48 billion m3 in 2035 with the bulk of that coming from the Karachaganak field, which holds more than 70% of the country’s proven reserves. The ADB expects the landlocked country to have an export capacity of 12 billion m3 by 2035. Meanwhile, with the world’s fourth largest natural gas reserves, Turkmenistan is well positioned to raise exports to neighboring China and Iran to reduce dependence on the Russian market. The ADB expects Turkmenistan to triple its natural gas production from 36.4 billion m3 in 2012 to 120 billion m3 in 2035, far short of the government’s plan to raise that to 250 billion m3 by 2030 due largely to constraints in the export pipeline capacity. Oil production is projected to increase from 216,000 bpd in 2010 to 355,000 bpd in 2035. The ADB expects Turkmenistan to export 80% of its natural gas production and 30% of its oil, enabling the economy to expand at an annual rate of 6.2% from $10.4 billion in 2010 to $46.4 billion in 2035.